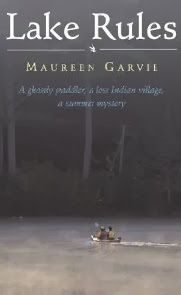 Like a perfect summer at the cottage, Maureen Garvie’s Lake Rules is full of good books, messing around in boats, and the occasional hike into town for added excitement and adventure. Thirteen-year-old Leia Greenway is almost delirious with joy over her new family cottage, Wasamak, on Half Moon Bay. It’s been a tough year for Leia with her parents’ divorce, her move from small-town Port Hope to Toronto, and her brothers, Hugo, 8, and Tim, 15, both coming down with serious cases of chicken pox. But she’s all prepared for the idyllic summer ahead, and when she makes a new friend in Cass, the girl in the cottage next door, everything seems perfect. Even digging a kitchen garden is an adventure, when they find pottery shards and other Algonkin Indian artifacts. The perfect summer comes under fire when a local developer plans to build a trailer park on the shore of their lake – on the site of what was once an Algonkin settlement. To make matters worse, the friends become suspects in a series of local crimes that threaten to kibosh their plans to prove that the land has lasting historical value. With a little help from an unexpected source, they not only put a stop to the destruction of Half Moon Bay, they also find a sacred Algonkin burial site that will ensure the land is protected in perpetuity. In Lake Rules, Maureen Garvie has carefully created a number of engaging storylines. It’s the multi-layered texture of the tale that makes it work so well: it’s part archeological adventure story and part mystery, but it’s also a moving exploration of family dynamics and the nature of friendships as well as a careful examination of the issue of First Nations land claims. Garvie is particularly good at giving voice to Leia’s inner voice and emotions and documenting her conflicts with Cass and her maturing friendship with her older brother. A satisfying addition to the literature of cottage life, Lake Rules joins the ranks of novels like Julie Johnston’s The Only Outcast, Kit Pearson’s A Handful of Time, and Jake MacDonald’s Juliana and the Medicine Fish. In the center of the windshield was a gaping hole. Filled with a sudden dreadful premonition, we ran back to where we had left the bundle … I was sure it would be gone. But the bundle was still there. Tim gathered it up. “Let's get out of here,” he said. “This place gives me the creeps.” We hurried to the canoe … or at least to where we had left it. The canoe was gone. 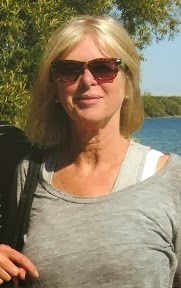 Lake Rules was written by Maureen Garvie. Maureen originally started writing this book in her French class, along with the help of Johanne Greenhow, another student in her school. They would pass it back and forth during the school day. Eventually she came up with this fantastic book! Leia, her mother, and her two younger brothers, Tim and Hugo, move to a cabin on a lake for the summer. Once they get there they meet Cass, another main character. Soon after, they find out that Cass's neighbor is planning to build a trailer park across the lake from them. Because of their love for nature, they end up doing everything they can to stop the process. I would recommend this book to anyone who likes adventure, suspenseful moments, and some historical facts as well. RATING: I would give this book four-and-one-half stars out of five! Lake Rules has been around in various forms for much of my life. In Grade 11 Johanne Greenhow and I worked on it in Miss Muirhead’s French class, continuing it in Miss Gosling’s Latin class and Mr. Wallace's history class, passing it back and forth in notes rolled up in empty ballpoint pens. Leila Garvie typed in the yellowed pages when they came to light, dropped the hopeless bits, and and read successive versions without complaint. Shelley Tanaka told me the truth. George Lovell listened to it not once but twice with graciousness and solicitous concern for Hugo’s rabbit. My brother Robbie said he liked it. The Ban Righ writing group, Bill Hutchison, Kris Andrychuk, Christina Decarie, Denise Kenny and Nancy Brown gave encouragement and insights; David Pratt and John Donaldson offered sound advice on what you can and cannot do in a canoe. Thanks also to my readers Nina Lewis, Jessie MacDonald, and Bonnie Thompson. To Fred Brown I owe the original of Marcel’s totem, to David and Robbie McCallum the models for Tim and Hugo, to Jay and Joe Yule the original boat on the horizon. Thanks to Nicola Matthews for the “ageing nymphomaniac” expletive, and the Kingston Yacht Club for the Nutshells. The excerpts from “At Gull Lake: August, 1810” and “Powassan’s Drum” are by Duncan Campbell Scott (1862-1947), a fine poet and and flawed deputy superintendent of Indian Affairs. Marijka Huitema’s master’s thesis for the geography department of Queen’s University, “Land of Which the Savages Stood in No Particular Need,” provided a clear-eyed picture of the Algonkins living in the area of my fictional Lake Wasamak. Thanks especially to Linda Pruessen and Key Porter Books for first guiding the book expertly into print.